30 DAYS QUESTIONS: #9 WHAT IS YOUR MOST FAVOURITE SOCIAL MEDIA & WHY? This is a tough one! I love having social medias and being involved in it. I have so many - probably too many for what I need actually. I don't use them all at once and those which I use constantly are tumblr, pinterest, instagram, twitter and snapchat. My most favourite? Well, I'm safe to say instagram. I'm so addicted to this social media platform because first it is easy to use. Even my little sister has it. 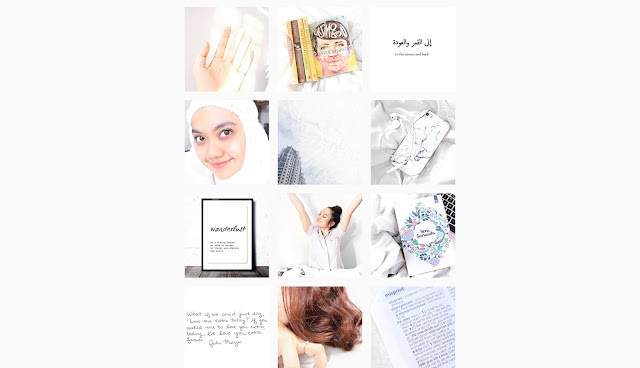 Second, because I have instagram theme, posting becomes more interesting, fun and challenging. My theme is white, bright and clean. I have to use my photography skill (seriously, I learn how to white balance and catch natural light! ), consider every aspect to match my aesthetic and theme, learn how to edit at least like a pro (no, I only use iPhone editing apps), I also learn how to arrange stuffs that I want to make a good portion in picture. It's quite challenging for me as someone who doesn't really into photography. Not only challenging and interesting, but also it's kinda tumblr but in a small portion. Looking at other people's instagrams who also have theme is fun and inspiring. I love Connor Franta's instagram although he doesn't have similar theme but his aesthetic and photography skill is one of the best out there. I learn so much only from looking at his feed.